Sleep is one of the most crucial parts of our overall health. 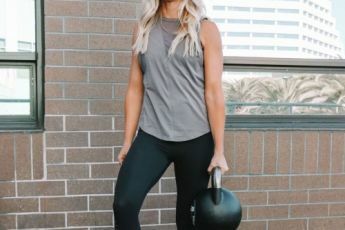 It is easy to give up an hour here and there to watch the Bachelor and sometimes almost impossible to get enough like when you have small children, but it is absolutely imperative for regulating things like weight, mood, muscle growth, and tissue repair. Most of us know how important sleep is, but we still don’t get enough of it and when we do the quality might not be ideal. With that being said, starting your day off on the right foot is equally as important as the way you end it. One surprising thing that can help you improve both your mornings and evenings? Your phone. I know, I know. It seems like the exact opposite of the answer you’d expect, but these meditation apps are a lifesaver and will help you form a healthy habit in your day to day routine. I’ve tested a few of the top-rated meditation apps to give my honest (and hopefully helpful) recommendation. I found this app and the task at hand (mediation) easy to digest. They’re quick 5 min meditations which were great as a beginner. After completing one of my sessions, the app even told me to congratulate myself. This little reminder might seem trite to more advanced meditators, but to me, it was the validation I needed that I was indeed doing something good for myself. If like me, there’s more than one member of your household who could use help in the sleep department, the variety of content Calm offers might be right up your alley. You can use it to play lullabies, music, sleep stories and meditations. Not sure where to start? Trust me when I say the sleep stories are the best part. There was one narrated by Matthew McConaughey where he spoke to you and then read Wonder by Chris Advansun. He’s such a talented storyteller; I really felt like he was right there telling this sleep story just for me and it filled me with calm. No more waking up in the middle of the night to white noise coming from your phone and realizing your phone will be dead because you forgot to plug it in. With Simply Being you can choose from 5 meditation times, and it will turn off when it’s over. You have the option to listen to the guided meditation alone or with music or nature sounds. The narrator is female which I dig. Her name is Mary, and she has worked in both conventional and alternative settings as a counselor and healing arts practitioner, which did seem to make the guidance a little more clinical (in a good way) than the other apps. Finally! There’s an app by women, for women who want to radiate confidence but are struggling with anxiety, low self-esteem or just feeling overwhelmed by life’s stresses. Clementine is witty, sharp and aesthetically on-point. I found the five-minute ‘Confidence boost’ to start the day or before a big interview to be really helpful. I actually used it before a job interview, and I got the job! Coincidence? Maybe, but it obviously didn’t hurt me. This is the most popular of meditation apps and for a good reason. I have been using it for about 5 years to practice mindfulness, get the skills I need to be more productive during the day and focus on the things that matter most. The Basics course is entirely free and will teach you the fundamental techniques of meditation and mindfulness– that’s a huge plus if you’re starting out. After that, by subscription, gain access to the full Headspace meditation library which includes meditations for everything from anxiety to mediation for kids. Not into mediation or already mastered it? There’s an app for that. Sleep Smart is a science-based app both for people experiencing sleeping problems and those that just want to improve their sleep. It helps you collect data about your sleep activity using the smart functions portion allowing you to make better adjustments to your sleep schedule. Sleep experts weigh in using the latest methods to give users tools to improve their sleep and establish new routines. Hi! I’m a wife, mother, former fitness instructor and clothes hoarder living in Los Angeles. I started my blog (bethanimalprint.com) in 2013 during my time at YouTube working with fashion bloggers because I wanted to better understand their processes and challenges. I now create content full time while spending time with my kids!